The Yachting World supplement of 1951 wrote that the 12 ton Gauntlet was one of the first boats to be built to the RORC rating – exactly what the originators of the Rule had in mind; fast and immensely seaworthy. 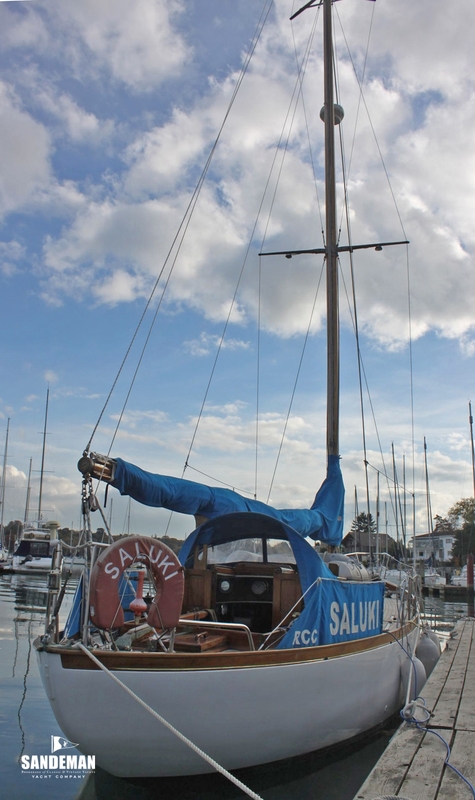 SALUKI has now been in the same ownership for over 40 years – and in that time looked after by the Elephant Boatyard. 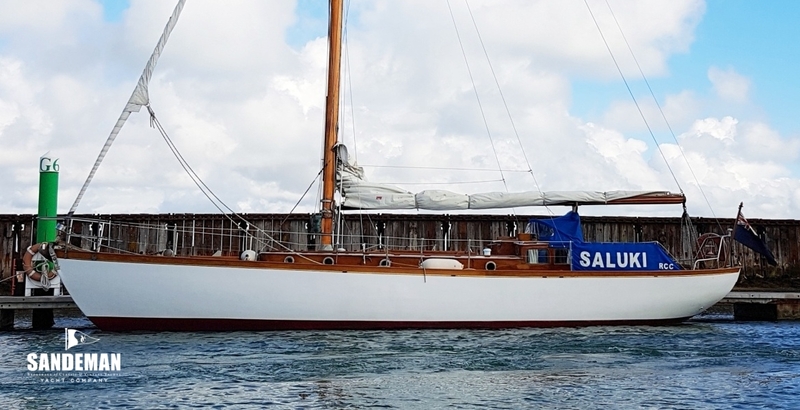 She remains in impressive and original condition – exhibiting a charming patina that is virtually impossible to replicate in a recently restored boat. The distinctive “Gauntlet” name merits mention of how it came to be. In short; HG May was approached by a potential client to design a boat suitable for cruising and offshore racing. On seeing the finished design plans for a 12 ton boat, the client apparently had second thoughts about accepting it and approached another designer for an alternative based on the same requirements – and in accepting it, rejected May’s design. May having invested time and effort was understandably annoyed but with faith in it; had the yard build him a boat to this his own design – and threw down the gauntlet in challenging his erstwhile client to a match race; one new boat against another. May’s confidence was fully vindicated by winning this contest comfortably and setting up the successful Gauntlet class against the current design concepts of his competitors. 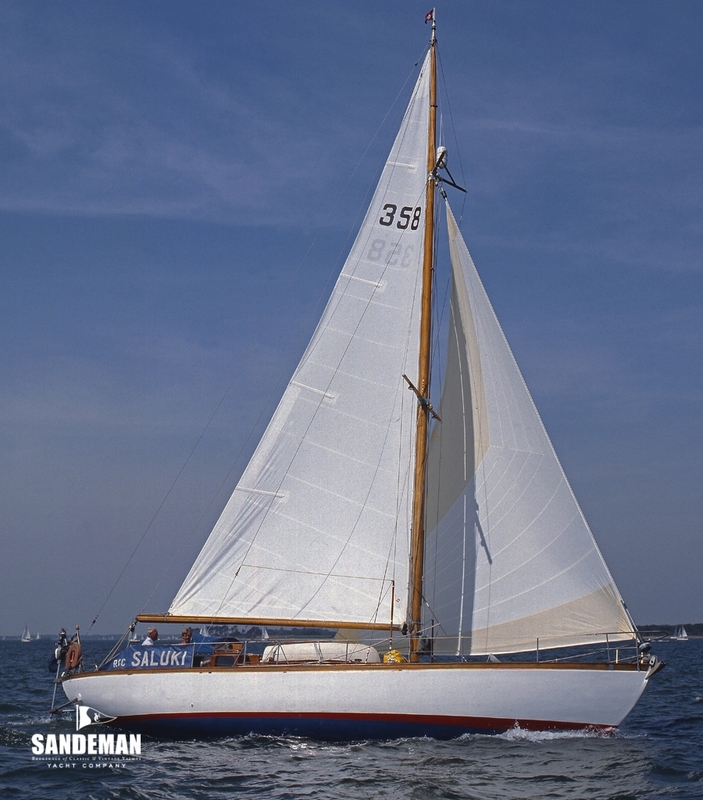 Launched in 1934, GAUNTLET was the first of the 12 tonners, after which the type has always been known. When she was designed very few, if any yachts had been specially built to the RORC rating and it was thought that it was this very type of yacht which the originators of the RORC rule had in mind when they produced it. In other words a comfortable cruising yacht with a fair turn of speed - although since then, a very different type of yacht has evolved. The 12-ton "Gauntlets" soon established themselves and sixteen were built in the five years before the 2nd World War, many of which have given a very good account of themselves in offshore racing; notably BRAMBLING AND GREENGAGE, to mention only two. Even before 1939 the "Gauntlets" had been noticed as hard-weather boats but equally they have proved remarkably successful under a variety of conditions and many people have wondered why. Some designers are lucky in getting good owners and "Gauntlets" have generally been fortunate in this respect; for a yachtsman who buys a vessel of this kind usually intends to go in for serious cruising with an eye to offshore and passage racing as well. 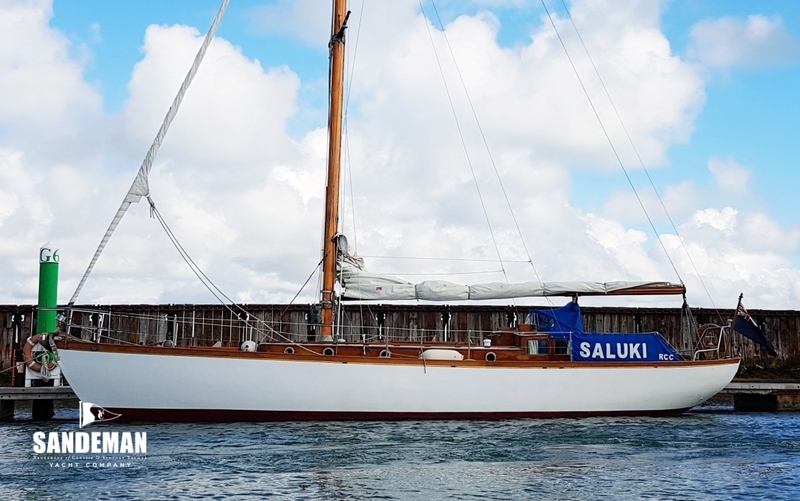 SALUKI the first 14-ton "Gauntlet” to be launched after World War II was built for Major W M Martineau MC vice- commodore of the Royal Lymington YC. Her second owner was Roger Leigh-Wood. 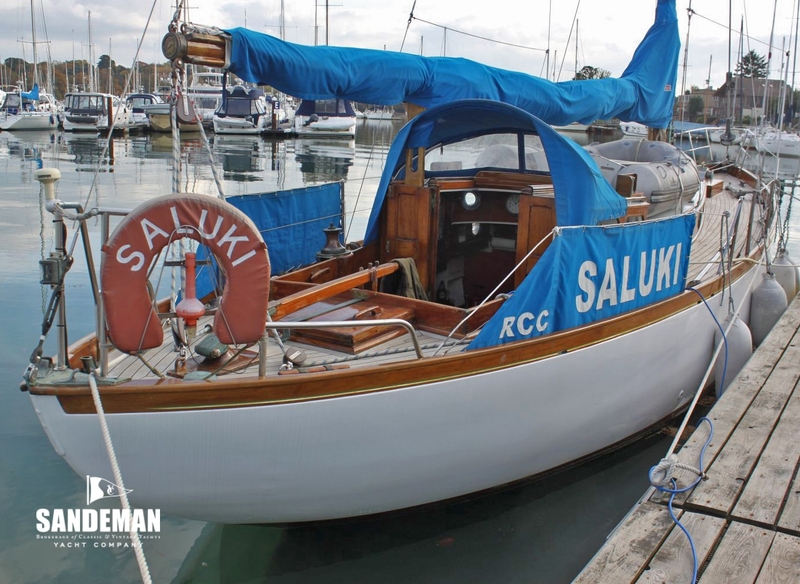 The most striking feature of SALUKI’s lines is the fact that with only a little over 5 ft 10 in draft, the 14-ton "Gauntlet” has a good deal less than the maximum then allowed by the RORC Rule, which, at 16 per cent of the LWL plus 2 ft, works out about 7ft 3 in. The next outstanding characteristic is the narrow beam of only 9 ft 6 in on a water line length of 33ft. The sections reveal easy garboards and bilges with a deep hull which allows a low cabin sole with plenty of headroom. The hull has been given little bow overhang and the profile runs in a sweet continuous curve from the stem head to the heel, A short canoe stem matches the bow, which, unlike many yachts to-day, is free from snubbing. A deep narrow boat with short ends is economical to build as the minimum quantity of timber is needed so construction can thus err on the generous side without adding unduly to the weight of the hull. The added strength in its turn makes for confidence at sea and durability leading to low maintenance costs. 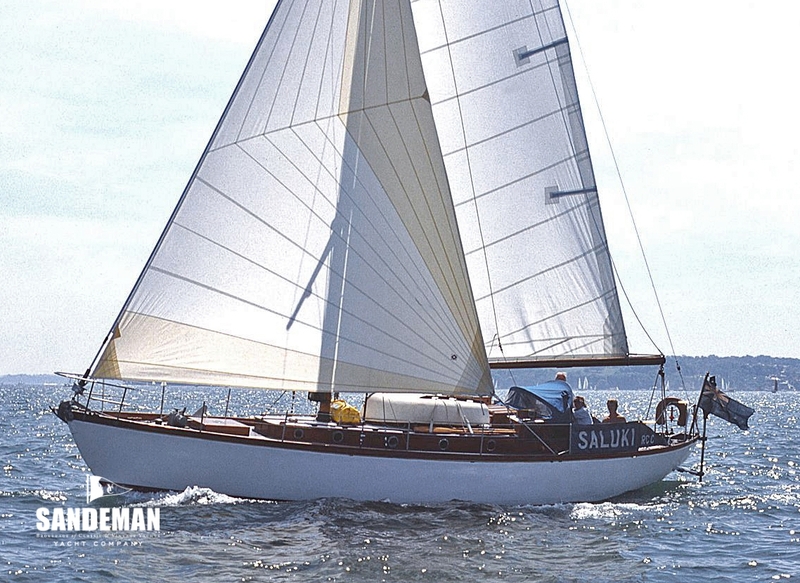 The displacement of 12.2 tons is high – embracing a heavy keel and with 5 ½ tons of lead, Saluki's ballast ratio is slightly over 45 per cent. 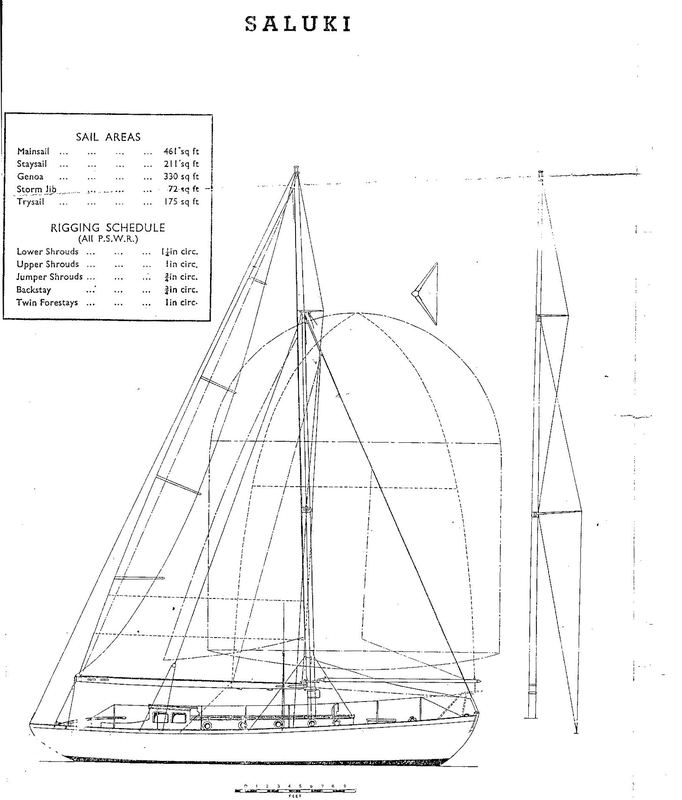 The secret of the "Gauntlet's" success probably lies in this heavy keel, which confers the stability which would otherwise be lacking in the narrow, easy sectioned, rather light drafted hull. Yachts of this type quickly take up an initial angle of heel and, as the weight of the keel comes into play, become increasingly stiff. The narrow beam helps to make a fast boat to windward but the steep buttocks, which cannot be avoided because of the depth of the hull amidships, tend to limit maximum speed, although the hull, on account of its other characteristics, would be very easily driven at medium speeds, Sail area can thus be kept on the moderate side. It is these factors which tend to make the" Gauntlets" perform well in most conditions and on most points of sailing, and so maintain a high average speed. The straight sheer combined with high freeboard gives the "Gauntlet" a slightly “boxy" look which takes a little getting used to. The above average freeboard might be a disadvantage in a vessel with long ends and a cocked up bow on account of the extra weight and windage where it is least wanted but the "Gauntlet," with her short overhangs, does not suffer in this respect.